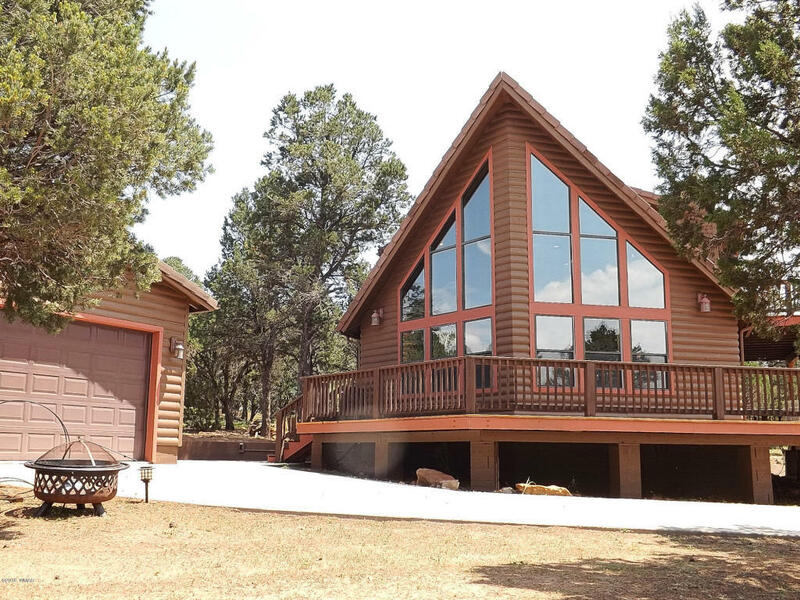 A spectacular cabin on top of the hill in the Mogollon Air Park. This cabin is nestled on a .41 acre corner lot with amazing tree-top views of the golf course in Pine Meadows and beyond. This home boasts a sun filled great room design with a pine enclosed fireplace, a wall of windows with breathtaking views, knotty pine T&G ceiling and walls, berber carpeting, hardwood flooring, a very large loft, a kitchen island with lots of cabinetry, water softener, reverse osmosis system and central heat and air conditioning. The upstairs boasts a separate deck with amazing views. The exterior offers a 24 x 26, 2.5 car heated garage, 3/4 wrap around deck, a fenced dog run, a 220 volt hook up for a spa a concrete drive, walkway from the road and a very nicely treed corner lot homesite. An amazing home!